The largest ever regular issue United States coin was the twenty dollar coin and came about following the discovery of massive gold reserves in 1848 California. It was called the $20 “double eagle” because the $10 coin, first minted in 1795, was known as the “eagle”. The new finding brought thousands of “49ers” to the region in search of riches and was a major event in the settlement of the American West. Legislation authorizing double eagle coins was passed on March 3, 1849. The bill was originally written to begin making the gold dollar only, but was quickly amended to include the twenty dollar coin when the immensity of the discovery became clear. The $20 double eagle was first designed by Mint Engraver James B. Longacre. The obverse featured Liberty facing left, wearing a small crown called a coronet, inscribed with the word LIBERTY. Longacre modeled Liberty from the ancient Roman sculpture, Crouching Venus. The reverse was patterned after the Great Seal of the United States, which had been an inspiration for U.S. coinage since 1797. The face value was shown as “TWENTY D”. 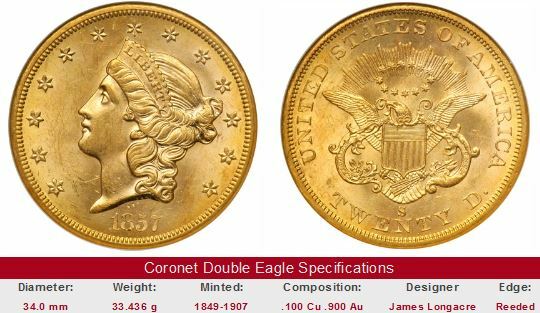 Numismatists have named the Longacre twenty dollar coin as the Coronet Double Eagle. It is often referred to as the Liberty Head type. Two twenty dollar coins dated 1849 were struck. One of them today resides in the Smithsonian Institute in Washington, DC. The whereabouts of the other 1849 $20 double eagle is not known. It was given to Treasury Secretary William M. Meredith and was eventually lost after his estate was sold. The first of the double eagle coins released for circulation came in 1850. The SS Central America, a ship transporting nearly $10 million in gold from the new San Francisco Mint to create a reserve for eastern banks, was sunk by a hurricane on September 12, 1857. In those years, banks conducted much of their business in gold and silver coins. The loss of the ship's cargo was a blow to financial institutions already jittery over the August 24 failure of the New York branch of the Ohio Life Insurance and Trust Company. Nervous depositors soon started a run on the banks. On October 3 there was a sharp increase of withdrawals in New York, and over the next few days withdrawals nearly quadrupled. Reports of financial instability, perhaps overstated, were quickly carried across the country by the new form of communication, the telegraph. The public's faith in the solvency of financial institutions continued to sour, leading to the collapse of many banks throughout the nation. The climax came on October 14 (a NY street scene pictured above), when banking was suspended in New York and throughout New England. Thousands of companies were forced out of business during this economic crises, dubbed by historians as "The Panic of 1857". The $20 double eagle quickly became the preferred denomination for international transactions and bank deposit holdings. Thus, larger quantities of double eagle coins were minted than any other gold denomination. Coronet Double Eagles are broken into three classifications. Class I was minted from 1850 through 1866. Class II originated in 1866 when the addition of the motto IN GOD WE TRUST was added above the eagle on the reverse. The motto was an appeal to the Almighty for national guidance and healing during the difficult Civil War era. In 1877, the reverse was modified by replacing the “D.” abbreviation with the full word “DOLLARS”, resulting in Class III double eagles. These were minted every year until 1907 when the Coronet twenty dollar coin series was replaced by the Saint-Gaudens Double Eagle. More than 100 million Coronet Double Eagles were minted over a span of 58 years. Many dates are rather common today in lesser grades and experience price movements paralleling bullion market activity, and are popular for gold buyers seeking a hedge against inflation with some built-in collectible value. There are, naturally, Coronet Double Eagles of great scarcity worth far, far above their bullion content. In 1861, Mint Engraver Anthony C. Paquet attempted to improve the reverse design by making the legend lettering taller, and the rim thinner. Unfortunately, these alterations caused premature die breakage, so the Paquet reverse was withdrawn after a short time in service. Before word reached San Francisco to stop the presses, a total 19,250 Paquet double eagles were released to the public. Only two such examples were struck in Philadelphia, making this one of the most famous classic rarities of American numismatics. A Philadelphia Paquet double eagle graded MS-61 by PCGS was sold in February 2008 for $2.5 million. Next comes a group that is unobtainable for almost everyone, commanding six figure prices for examples showing even some wear: 1854-O, 1856-O, 1870-CC, 1883, 1884, and 1887. These are certainly key dates of the Coronet Double Eagle series, but don't expect them to continue the meteoric ascendancy they've been enjoying recently. However, in the long haul, you can't hardly go wrong by owning one of these fantastic coins. Interestingly, several discoveries of long lost hoards of gold coins suddenly added significantly to the then known supply of Coronet Double Eagles. Many of the Mint State examples dated 1856 and older we have today were found in August 1934 by two Baltimore teenagers digging in the cellar of an abandoned house. They unearthed nearly 3600 U.S. gold coins worth over $11,000 face value. The following year, a judge declared the boys as the lawful owners of the cache, whereupon they promptly auctioned the coins off for $22,500. The highest price paid was $105 for an 1856-O. From 1852 to 1857, the S.S. Central America transported an estimated one-third of the California Gold Rush yield to the east coast and elsewhere. On September 3, 1857, the ship departed Panama, bound for New York, with a cargo of nearly $2 million in gold coinage and up to $8 million more in gold ingots, including the world's largest assayed gold brick, weighing 80 lbs. 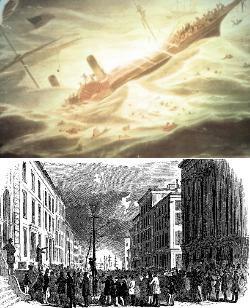 The ship sank on September 12, after being battered by a hurricane for four days. About 425 people went down with the fabulous fortune in 8500 feet of water, about 160 miles east of Cape Hatteras, North Carolina. A total of 153 survivors were rescued. The loss contributed to the failure of thousands of banks and businesses during the economic collapse known as "The Panic of 1857." On September 11, 1987, the Columbus-America Discovery Group found the sunken wreck. A decade of litigation ensued, ending with the courts awarding 92 percent of the treasure to the Columbus group with the rest going to insurance companies. Amongst the recovery was 5200 new 1857 double eagles from the San Francisco Mint, one of which is pictured above. In August 2003, the wreck of the S.S. Republic was found in 1700 feet of water about 100 miles of the coast of Georgia by Odyssey Marine Exploration, Inc. The ship was lost on October 25, 1865 to a hurricane, carrying $400,000 in mostly $10 and $20 gold coins. Fewer than ten lives were lost in the sinking. The hard currency was bound for New Orleans to assist in the early days of post-Civil War Reconstruction. Thousands of coins were brought to the surface, many of them in pristine condition, grading as high as MS-66. If you are a higher end collector and want to add a key date Coronet twenty dollar coin to your numismatic showcase, it is advisable that you consider only double eagles that have been certified by one of the four leading grading service companies: PCGS, NGC, ICG, or ANACS. Not surprisingly, there are quite a few counterfeits around, often sold under the banner of lesser known grading services. Smart buyers have greater confidence in coins graded by any of the Big Four, and will bid accordingly. The opposite is true for just about any other grading service. The links below initiate a search of eBay coin auctions for the indicated key date Coronet Double Eagle. The left hand side of each "Sales Box" reports value trends over a very long period of time for the key date in VF-20 condition. The percent annual increase since 1950 is computed for comparative purposes. Most likely, you won't find any examples on the auction block, attesting to the scarcity of the key date Coronet Double Eagles. Also, the coin pictured for sale in the right hand side, if any, is not necessarily the same condition coin as that represented in the value trend analysis on left hand side.